This independent Position Paper provides information for public transport authorities and operators. PT authorities in the Netherlands can be a Province or a City Region. The Paper answers the question: “How to increase the share of electric battery buses for public transport in the Netherlands?”. The research started with analysing the development and deployment of electric battery buses globally and in the Netherlands specifically. 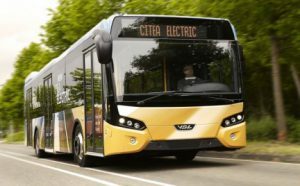 In 2014, the current share of electric battery buses in the Netherlands was only 1% out of 5,000 public transport buses. Buses with the EEV (Enhanced Environmentally friendly Vehicle) emission norm were dominating the Dutch public transport bus fleet. These buses emit low local emissions. This situation might have caused the low determination to switch to fossil fuel free buses. 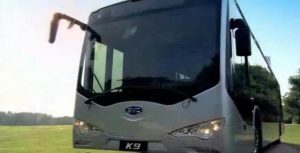 Another reason could be the perception of the public transport authorities and operators about the disadvantages of electric buses in comparison to diesel buses. An electric bus has lower driving range, higher purchase cost, and lower passengers’ capacity. The uncertainty of battery’s life cycle is also high. In order to justify this perception, a calculation of the Total Cost of Ownership (TCO) is developed for this Position Paper. The main question was: “Is operating electric buses really more expensive than diesel buses?”. The TCO components were lease cost, fuel cost, maintenance cost, other operational costs and external environmental cost. The Amstelland-Meerlanden concession was chosen as a case study. It is one of the largest public transport concessions in the Netherlands. Currently, this concession operates more than 265 diesel buses. This research compared the TCO in two situations. The first one is the deployment of 100% diesel bus fleet. The second situation is replacing a part of the diesel fleet with electric buses. The result shows that replacing a part of the diesel fleet with electric buses delivers lower TCO. It is due to reduction in the fuel cost, maintenance cost and external environmental cost. Another conclusion of this research is that the above-mentioned disadvantages will disappear in the course of time. As the battery technology is continuously developing, batteries are expected to become lighter and cheaper. As a result, electric buses will be more interesting and more produced. This would lead to a lower purchase cost. It requires a mind shift of many parties, especially public transport authorities and operators to embrace these opportunities and to strengthen their determination to preserve the environment. Would you be interested in calculating the TCO of electrifying public transport buses in your city? Please do not hesitate to contact us. We would love to discuss it with you.